Friday 27 July 2018, 6.00pm, Presbyterian Church Hall, 91 Tenby St, Wanaka. Professor Professor Colin Wilson, School of Geography, Environment and Earth Sciences at Victoria University of Wellington. 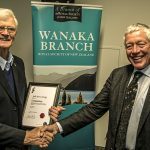 Colin was awarded the Rutherford Medal at last year’s New Zealand Research Honours for his research into understanding large, explosive supervolcanoes and the hazards they pose. The Rutherford Medal is the Society’s highest award, instituted at the request of the Government to recognise eminent research or technological practice by a person in any field of science, mathematics, social science, or technology.